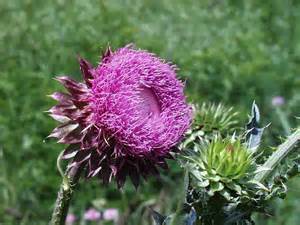 General Description: Musk thistle is typically a biennial though may be a winter annual. It can grow up to 7 feet tall. Flower Description: Flowerheads mostly solitary and large, up to 3.1 inches across and nodding. Bracts under flowerheads are broad, some reflexed with a spiny tip. Each plant can have 50 to 100 flower heads. Leaf Description: Leaves are alternate, deeply lobed, spiny and may have some hairs on the underside leaf veins. Stem Description: Stems have spiny wings. Fruit/Seed Description: Seeds (achenes) are smooth and hairless. It invades pastures and fields, crowding out desirable forage plants. Livestock will not graze in areas heavily infested with must thistle, thus decreasing available pasture. It hinders stream bank access, and is problematic in grain fields.